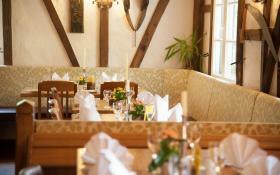 Our Bergische Landhausküche offers something for every taste! Enjoy regional and international dishes in one of our two dining rooms or on the large terrace. We prepare fresh at any time, taking into account the seasonal offers. The Wißkirchen is located in a touristically important location, in the heart of the Bergisches Land, in the immediate vicinity of the Altenberg Cathedral. The house has historical foundations and once housed a brickworks, then a sawmill. In the 1950s, the post office was still located in the restaurant. Today we have a restaurant capacity of 100 seats and a hotel capacity of 12 rooms - mostly double rooms. Our outdoor terrace invites you to enjoy your stay in summer. In addition to our à la carte service, we also organise private parties, conferences and seminars. In addition to seasonal, modern country cuisine, our superior cuisine also offers regional specialities using always fresh products. 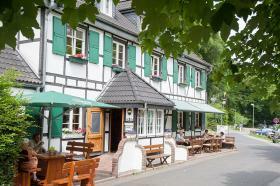 A table reservation or the booking of a menu/ offer is in the "Wißkirchen" via GlobalGuest always for free you as a guest!